Developed in Australia for Australian conditions. Patented formulation. Field trials consistently show the benefit of OUTRIGHT 770 particularly when conditions are harsh. Trial conducted at Nungarin WA in 2013 demonstrated that OUTRIGHT 770 (0.5%) increased control of both Melons and Burr Grass when applied with RoundUp* Attack and Garlon* Fallow Master. The typical use rate for Outright 770 is 100 - 500 mL/100L. The high end of the usage rate is recommended when using spray water with high hardness (>340ppm), conditions are hot and/or dry, when treating difficult to control weeds. If water is very hard (>1000ppm) then additional ammonium sulphate may be required. 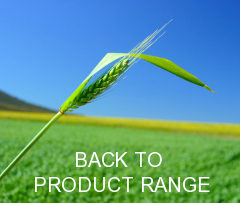 OUTRIGHT 770 contains 3 key ingredients which can help maximise the efficacy of a herbicide application. Methyl Oleate is a penetrating oil which can help active ingredients to penetrate the waxy cuticle of weeds. It will also reduce surface evaporation thereby increasing the time for foliar uptake. Non-ionic Surfactants will help the spray droplets to adhere to the target and then spread across the target to maximise uptake. Ammonium Sulphate can help minimise the detrimental effects which hard water can have on certain herbicides as well as increasing uptake and reducing incompatibility between certain herbicides. Trial data shows that OUTRIGHT 770 can improve the performance of Glyphosate and help overcome the loss of efficacy associated with hard water. A controlled glasshouse trial (See product data sheet) used sub-lethal doses of Glyphosate herbicide (average of 111 & 222 mL/ha Roundup* CT applied at 64L/ha) applied to oats at 2 – 2.5 leaf stage. Assessment was by fresh weight at 14 DAT. Treatments were made up in three water hardness levels and with three rates of the adjuvant OUTRIGHT 770. Trial data shows the well-established fact that as water hardness increases, Glyphosate efficacy decreases. This trend is reduced or even eliminated when OUTRIGHT 770 is added to the spray mix. 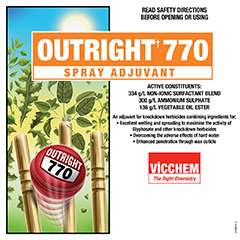 OUTRIGHT 770 continues to be field tested with other herbicides and it is expected that the novel combination of highly efficacious adjuvant components will mean it will offer performance and convenience benefits to many herbicide applications.